This is a question I get asked a lot by people that want to get into wedding photography. And trust me, I get it. It's hard to book your first wedding. You have to find someone who is willing to trust you with photos of *maybe* the most important day of their life. To do this, you either have to find someone who doesn't care that much about photography or someone who has seen enough of your non-wedding work to trust you. Here's the approach I took, but there is definitely not just one way to do this!! I did this very first thing. I had a camera and I knew my basic camera settings, but I had never shot a couple before this. It was expensive, but 1000% worth it. I found a photographer who I was in love with (shoutout to Tessa Tadlock!! still my hero) so when she announced a workshop, I jumped on it. The reason this workshop was so amazing was because it covered a little bit of everything and it gave me A TON of content. I needed both of these things. I needed someone to help me with camera settings, posing, editing, etc. And I didn't want just one shoot. This one had 4, so it was a huge boost to my portfolio and almost enough to set up a whole website. The other huge thing I got out of it was a network of other photographers. I still stay in touch with a lot of them and we use each other when we need second shooters, models, or just advice! You can also find portfolio building workshops which are usually cheaper and just for content instead of education. If all you need is content, this could be a better option, but if you have never shot a wedding before there is probably a lot you don’t even know you don’t know. Mentorships are another great option. Just be prepared to pay about the same amount for only 1 shoot. You will get a lot of one-on-one time for questions, which is incredible, but I always think these are better used if you already have a little bit of experience and want to take your business to the next level. Wait…how do you find the perfect workshop?? I have talked to a lot of people who have said that they attended a workshop that was a complete waste of time/money. This makes me really sad because they cost a lot and have so much potential. In my opinion you should find a photographer who's work you absolutely adore and then see if they host workshops. Do your research -- how many shoots will there be? How many other attendees? Is it in a location you would want to shoot in again? Even with 15 people, shoots can feel super crowded, so the fewer people the better. And you're going to get a ton of content from the location its at, so make sure its somewhere that you are hoping to shoot at more! If you live in Montana and hope to book mostly there, then doing a workshop in Malibu doesn't make as much sense as doing one in say Colorado or Utah. If you are hoping to become a travel photographer then it does! But you will need to make sure to build your portfolio with a few different locations so people see you really travel! More on that in another blog post!! The bottom line is nobody is going to book you if you don't have any work to show. So you have to start out shooting for free. BUT. That doesn't mean you should find someone getting married and shoot their wedding for free. That is a ton of work, and you deserve to be paid for that work. So it might sound like I'm contradicting myself, but stick with me. But I totally needed these shoots to launch my website. In addition to my workshop photos, I did 1 more styled elopement and 4 additional styled engagements before I launched my website. I would shoot anyone who would let me. My brother, by best friend, people I had never met, but someone told me they would have loved more wedding photos. Not all of these shoots were strong enough to have full galleries, so I did more than I probably needed. But I was also getting way more confident in my directing and shooting ability. You might have already done this and then that's perfect! But I have seen way too many people rely solely on Instagram and I believe you NEED a website for people to take you seriously (and educate clients on what you're all about!!). Post your work on here! Blog full sessions so people get an idea of what you will deliver to them. Even if you don't have a full wedding, if you just have a session in wedding dresses that helps a lot!! When I booked my first wedding, I didn't have a full wedding (I had never done a full wedding or even second shot) but I had 2 styled elopements on my website and about 4 engagement style shoots. These days it is so easy to make a really professional website and its not that expensive. I use Squarespace, but I know a lot of photographers use Wordpress and Flothemes. Find your preference and then get yourself online! Get something up and you can always continue adding to it and making it better. Don’t put it off just because you’re still working on your about me page (yes, that was my biggest struggle too!). For some people, their ideal client may just come to them and that's amazing! For me it didn't happen that way. Even after doing all of the above, I knew if I wanted to book someone I needed to put myself out there. So I scoured facebook groups (find wedding planning groups in your area) and #engaged on Instagram. I contacted a lot of people with a lot of radio silence. I put myself on Thumbtack, The Knot and Wedding Wire. I also looked on Craigslist. Which I know can be sketchy, but that's exactly the place I found my first wedding clients! They posted looking for a photographer and I responded. I sent them a link to my shiny new website and gave them a very low price ($750 to be exact). I got nothing back for a few weeks. But then it happened. I got the email back. She told me she loved my work, but with their budget the most they could pay is $600. This is low, and I wasn't even that sure they were real people on the other side. But I knew that this was my first wedding, so I figured I'd at least meet them. I was very cautious, and made sure to meet them in a public place. I brought a contract and answered all their questions. I also offered them a free engagement shoot. While this might seem weird since they were paying me so little, I thought it would secure them to chose me and give me more content! And it completely worked! 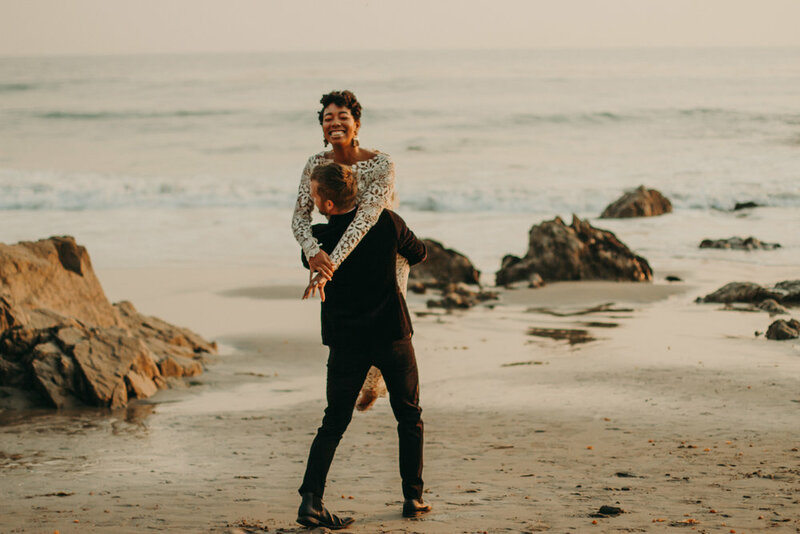 There engagement photos were some of my favorites and they were so grateful. So that’s my big secret! I found them on Craigslist and I got luck that they were awesome. But if I hadn’t done all of the above, they wouldn’t have responded to me and ended up booking me. This isn't really a step, but I do think its really important to mention. Be transparent. Don't tell people you have shot weddings before if you haven't! They will probably find out. I was nervous to tell my craigslist couple I had never done a full wedding, but since I was charging so much less than average and they had seen lots of my photos they trusted me! They were also patient with me and we worked so well together by being completely open about it. I do this until after I booked my first wedding, but I did before I actually shot that first wedding, and I'm so glad I did! Second shooting can be a great way to add to your portfolio, but you;ll also learn a ton about how wedding days work. There's a lot to it and seeing an expert run through the day gave me a lot more confidence going into my first wedding. Some people start out second shooting for free just to make sure they get the gigs, and I won't tell you what to do, but even with no editing, its still a lot of work to do a wedding and I don't think anyone should do that for free. You also will likely not get a complete wedding for your portfolio so be very picky about what you’ll do for free. But when you can make $200-$400 per wedding, it is totally worth it! And you can learn so much from the lead photographer! Even when I was just starting out, I only shot for people who let me edit my own photos and use them in my portfolio. Be sure you know exactly how the lead feels before you agree to it. Some people have strict rules about not sharing any of the photos, and for me its just not worth it if I can't use them. One other thing to note-- when you are second shooting, you are not there for you. You are there for the lead photographer. So yes, its cool to have stuff to add to your own portfolio, but don't ever interrupt the lead or go behind their back to get photos of the couple you want. I've had some bad experiences with seconds doing this to me and its not cool, you are there to help them, which is also why you should be getting paid for your service. I have found all my second shooter gigs through social media! I'm in a 2nd shooter facebook group for my area and I've also DMed people on Instagram if I love their work and want to second shoot for them! Most people will not be bothered if you tell them you love their work! Even if they don't have any need for you, you will still make their day! I mentioned I had a couple simple styled elopements when I started, but I have seen photographers do way more than that. They'll do lots of these, to the point where they look so busy and are putting out so much amazing content that people do start coming to them. You'll probably want to go bigger than I did and include other vendors. Getting florists, hair stylists, calligraphers, etc. will get you lots of connections and amazing detail shots that will add a lot more to a blog post. That's all!! I put in a lot of work up front, but then I booked my first wedding! And let me tell you, the first one is the hardest! After that, people will start to come to you! (maybe not all at once, its still a process). But get creative, put yourself out there, and it will happen!